After 100-plus years of MLB card sets from tobacco and candy companies, one forgets how few releases exist for teams that played in America's minor league zip codes. Prior to the 1970s, those cities rarely turned local interest into collectible cards, thanks to the prohibitive cost of small-scale photo printing. 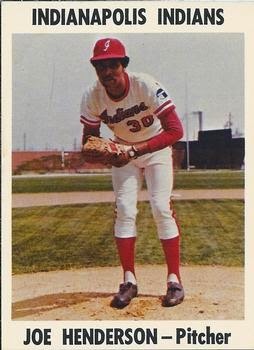 Indianapolis represents a bright spot from this period, as creator of 1970s cards replete with high stirrups and sweet mustachios. I've covered three of their team sets prior to today's post. For modern collectors, the downside of these 1970s sets remains small print runs. Even an established minor league franchise like the Indians would run out of reasons to print cards after ten thousand or so, just drips and drabs compared to the millions of Topps gum cards. I borrowed today's #5 scans from TradingCardBB's set gallery because I've yet to locate a type card of my own in the public market. 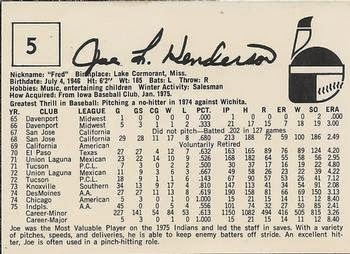 I love the back of this Joe (nickname: "Fred") Henderson because of the story it tells. He briefly gave up pitching in 1967 and baseball itself in 1969. Born on the 4th of July, Joe still put in time as a Mexican Leaguer with Union Laguna in 1971. He was 1975 MVP for Indy, despite being a reliever, paralleling the era's emergence of star firemen like Rollie Fingers and Bruce Sutter. While not reflected on this card, "Fred" also played parts of three big-league seasons, even winning a pair of mid-season games for the 1976 champion Cincinnati Reds. Joe's nephew Dave Henderson made some World Series noise himself in 1986, figuring in the game Peter Gammons called his top World Series moment. The 1976 Indianapolis set comprises 26 cards: 22 players, 3 team staff, and a checklist. I've bolded all players with MLB experience. 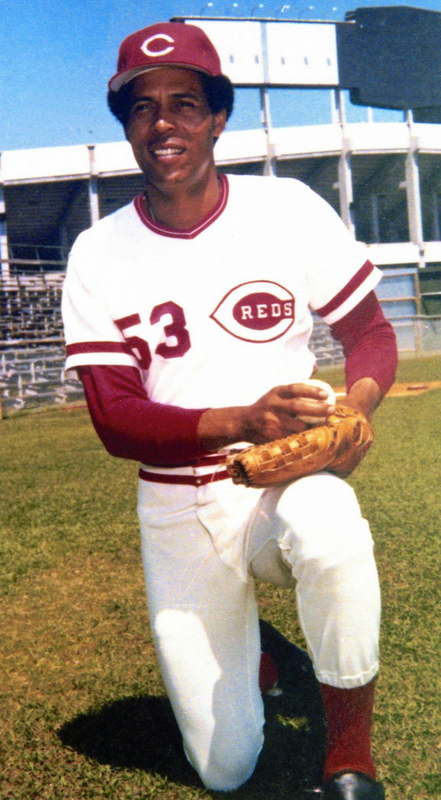 As the Reds AAA affiliate in those days, most players got at least a September call-up during their careers. Value: Ray Knight's the best-known Indianapolis emeritus from 1976, but several of its players appeared for the Big Red Machine, pushing collector demand above your average 1970s team set. I'd expect $25-35 as the set cost and most singles would be a few dollars.